QuickBooks Online Simple Start provides essential small business accounting tools while leaving out more advanced features that are usually unnecessary. You will find a good set of features for most new and many existing small businesses in this online accounting software without being overwhelmed by unneeded modules. QuickBooks Apps provide additional features if needed, and at a reasonable cost. All prices in this article were effective in mid-summer, 2018. The ability to expand to more powerful accounting software if your business grows is helpful since there will be no problem with importing all customer, invoicing, and other account data. The 30-day free trial is long enough to help with deciding if this is the best accounting solution for your business. If you currently use another QuickBooks version and think Simple Start would be a better choice, you'll have to think again. Data from higher versions of QuickBooks is not yet backward compatible as of summer 2018, and will not transfer to QuickBooks Simple Start. The online accounting software is easy to learn and to use and is an ideal long-term solution for individual contractors and freelancers, businesses that are just getting started, and many other small enterprises. Android, iPhone, and iPad apps add convenience for small business owners who are frequently away from the office. Invoices: Create and customize invoices. Sales and Expenses: See money coming in and being paid out, track expenses and sales. Reports: Twenty small business reports can be customized, such as balance sheet, sales, and profit and loss. Customers: Store contacts and customer information in the searchable Customer Center, where you can also find each customer's outstanding balance and transactions. Reduce Data Entry: Automatically download transactions from business bank or credit card accounts. If you're currently using a spreadsheet or manual ledger to do your accounting, you should find QuickBooks Online Simple Start much faster. Entering data is easily done from a home screen that intuitively guides the user to the specific tools needed. Accounting reports are generated with very few mouse clicks, and small business tax information is automatically organized for future reporting. Quicken Home & Business is fully featured personal finance software with very basic small business accounting features. It may sound ideal for a small business, but the business features in Quicken Home & Business are not flexible enough for more than a small side business. QuickBooks Online Simple Start is the better way to go since it's designed for accounting and it's affordable. If your business grows, it's easy to upgrade to QuickBooks Online Essentials ($11.50/mo. ), so more than one person can use the software and bills are easier to manage and pay. 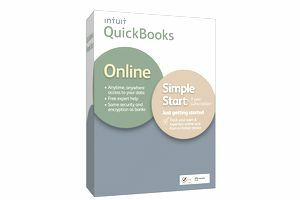 If you have a larger inventory, you should seriously consider QuickBooks Online Essentials Plus ($15.50/mo.). While QuickBooks Online Simple Start requires no specific accounting knowledge in itself, talk to an accountant about setting up your company information and reviewing records on a regular basis. Small business accounting software saves time and can reduce how much you'll need an accountant, but nothing replaces a licensed professional who can utilize the software (and their own) to its full advantage. QuickBooks Online Simple Start is being rated here at 4.5 stars, but only for very small businesses. It is not adequate for businesses managing substantial inventory or that require a considerable amount of fiduciary oversight.